Snowpocalypse saps the market of sales!!! Due to the snow that we had in Fubruary March housing report will show a higher than normal inventory increase and a lower than normal pendings and closes. In March the number of total active listings in King County rose by 106.94% from 2060 to 4263 . 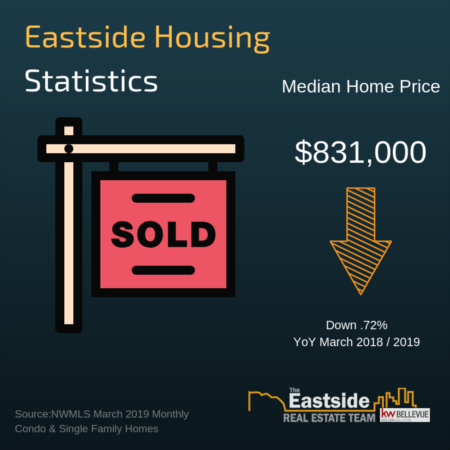 On the Eastside, inventory increased of 115.19% YoY from March of 2018. While these numbers may look drastic, some of the increas could be caused by the delay caused by the weather in February. For our King County home sales report market activity looks like it has started on the upswing…. and shows signs a classic spring market. See above Market Action Index (a gauge of market activity). Buyers affordability remains high, with interest rates around 4.02%! Also, be sure to check out the national real estate trends at Realtor.com. If you compare the national picture against this months home sales report, you will see that King County and the Eastside are top performers! Sellers and would-be sellers the early bird will get the worm! While the market has slowed a bit, it inventory still favors the sellers. There are still homes selling with multiple offers and while prices are not falling, price reductions are increasing. If you intend to sell your home, you need to be realistic in time-frame and price. To be one of the homes that sell you must have the best features and benefits for the price. If your considering a sale, please click here for a complementary market analysis of your home. RATES ARE GREAT!!! The best they have been in 13+ months. Competition is coming back to the market. Understand that this will last until at least the middle of June. Don't be supprised if you have to compete for a good home. We are seeing some ability for move up buyers can now use the Contingency clause to allow them to secure a future home before putting their home on the market. A great opportunity for those that have had their move up dreams on hold. Below are links to homes available for the King County communities of Bellevue, Issaquah, Kirkland, Seattle, Redmond, and Sammamish. Just click on the link to your neighborhood for the complete breakdown for the week of 4/12/19. I hope you find this home sales report useful. Please share with your friends. To find out how much your home is worth in today’s market, please click here for a complementary market analysis of your home. And if you are interested in selling your home for top dollar, in the shortest amount of time, please contact me anytime at 425-200-4093, or click here to send me an e-mail requesting further information.